Shortly before Halloween, I was contacted by Emily Straubel of Reed's Inc. asking if I'd like to sample its Flying Cauldron Butterscotch Beer. I'm a fan of Reed's Ginger Brew and Virgil's Root Beer, so I eagerly agreed to sample its butterbeer, I mean, butterscotch beer. 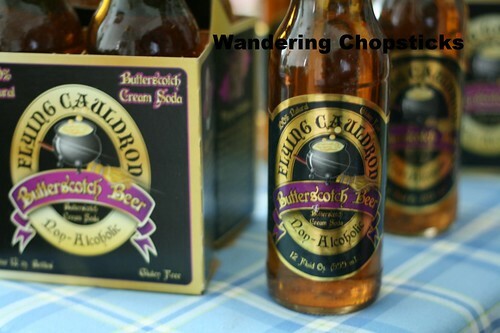 While Flying Cauldron Butterscotch Beer isn't affiliated with Harry Potter, there are plenty of allusions. 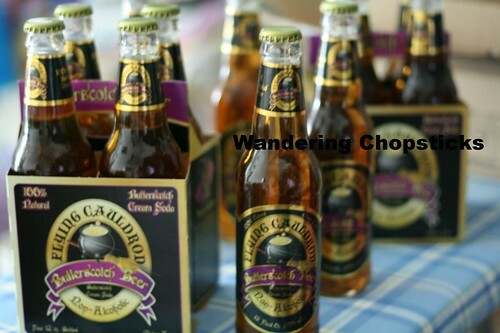 The flyer said, "Taste the magic of a wizard’s buttery, vanilla, cream soda brew. Since 1374, the Flying Cauldron has been making this magical brew for under-aged wizards, and wizards who are young at heart, at their brew pub in Hogsbreath, England." Not Hogsmeade, but Hogsbreath. Not the Leaky Cauldron, but Flying Cauldron. Not butterbeer, but butterscotch beer. It's not affiliated with Harry Potter. Got that? I was expecting a case, and was pleasantly surprised to receive four cases of 4-packs. Nicely surrounded with lots of styrofoam to prevent breakage. The packaging, with the flying cauldron and all, gave a nice ancient feel to the product. 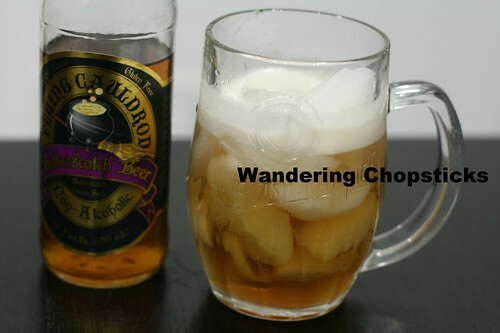 The golden amber hue of the drink was what I thought butterbeer, I mean butterscotch beer, would look like. Poured into a beer mug with ice cubes and there was a nice amount of foam. 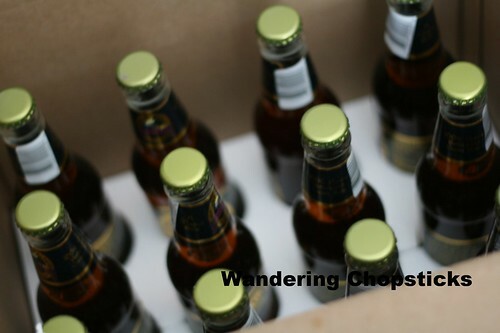 Like drinking butterscotch cream soda -- buttery, vanilla flavors. The nutrition facts lists 30 grams of sugar, which actually is less than the 39 grams of sugar in a 12-oz can of Coca-Cola, but it tasted much sweeter. Like drinking candy. Is it the stevia? The ingredients are: sparkling filtered water, unbleached cane sugar, vanilla extract, natural caramel, natural flavors, stevia rebaudiana leaf extract. Non Alcoholic. Free of preservatives, caffeine, gluten & GMO’s. As I continued to drink though, the butterscotch beer grew on me. Until I one day taste butterbeer at the Wizarding World of Harry Potter, I'd say Flying Cauldron's Butterscotch Beer is pretty close to what I imagined butterbeer would taste like. 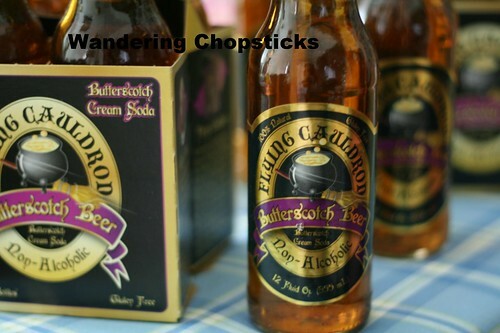 I've seen 4-packs sold at some grocery stores for $5.99 or you can buy from the Flying Cauldron Butterscotch Beer directly from Reed's website. Thanks again Emily and Reed's Inc. for the chance to taste this delicious brew. 1 year ago today, longans. 2 years ago today, Apple Juice and Red Wine Turkey Brine. 3 years ago today, Broccoli Bacon Pasta. 4 years ago today, Chicken Pot Pie. 5 years ago today, Angel Face roses, lettuce, and strawberry blossoms. We found this butterscotch soda at Galco's in LA and last year at Fresh & Easy during the Halloween season. TC and Bert like this more than I do. It is very sweet. Too sweet. I have actually made floats and Jell-O out of this. I've seen it at Fresh & Easy too. Otherwise, except for specialty shops like Galco's, I have yet to see it at my usual grocery stores. I think it's too sweet too, so I was really surprised that it had less sugar than Coke! Sorry! I pasted your comment above since I had to delete it with the link. The website even lists a "giggle potion" recipe that suggests making floats with this. I haven't thought of Jell-O, but that sounds pretty awesome! Maybe I'll try it if I ever throw a Harry Potter party. No. Blanket policy because of all the spam and self-promotional links. No anonymous comments either. It's been in my comment policy for a while now. In the early days of blogging, it seemed like linking was acceptable because we were a smaller community and more congenial. But these days, too many bloggers drop links just to promote themselves so I instituted a blanket policy on all links. I don't get as many comments, but at least the ones I do get are genuine.